Breathing in sweet forest air and admiring beauty of mountains and sparkling lakes while sitting comfortably in your saddle – that is a perfect travel, isn’t it? 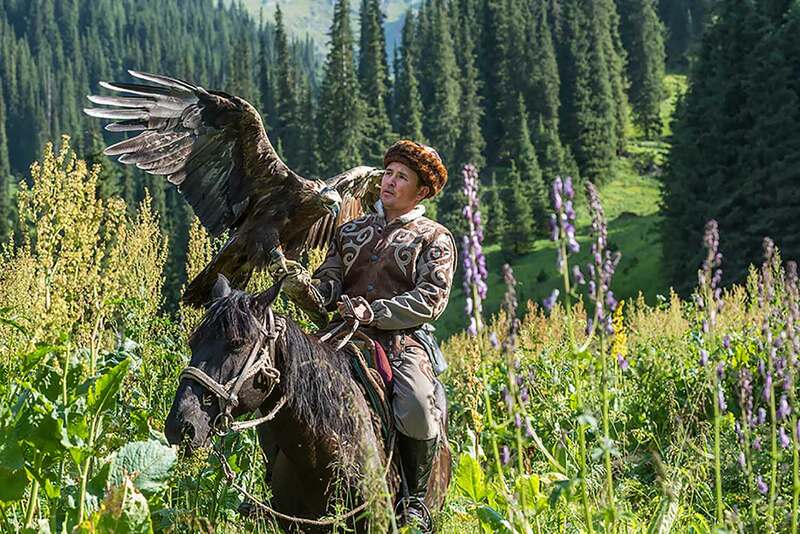 Amazing nature of Kazakhstan, the promised land of ancient nomads, opens up from a new side when you discover its beauties in the way the ancestors of modern Kazakhs did – sitting on horseback. Stocky but strong and enduring horses will take you along the mountain paths through dense forests; they will ford turbulent rivers without hesitation and gallop at full speed across hot desert for a long time. You will definitely recall such travel in your memory again and again; at least, until that time when your legs will stop aching after long sitting in the saddle. Of course, this is a joke and light discomfort after horseback riding will mean that your muscles exposed to some physical exercise – kind of exercise with steppe flavour. Above all you should add an invaluable positive experience of interaction with this proud animal: horses are very smart and sensitive, that’s why you should learn to control your emotions all along the way. Bear in mind, that horses can quickly understand whether a rider is afraid of the horse or not. If yes, then be prepared that your faithful horse will behave naughty, won’t obey you and will do its own thing, not yours. Therefore, horseback riding tours, especially long-lasting ones, will excellently harden you and build your character. Sooner or later, you will understand how to make the horse understand who is in charge here. Later you can use this experience in your normal life, with some adjustments though. In general, horseback riding does not have any disadvantages at all – this is very interesting, fascinating, and even useful! 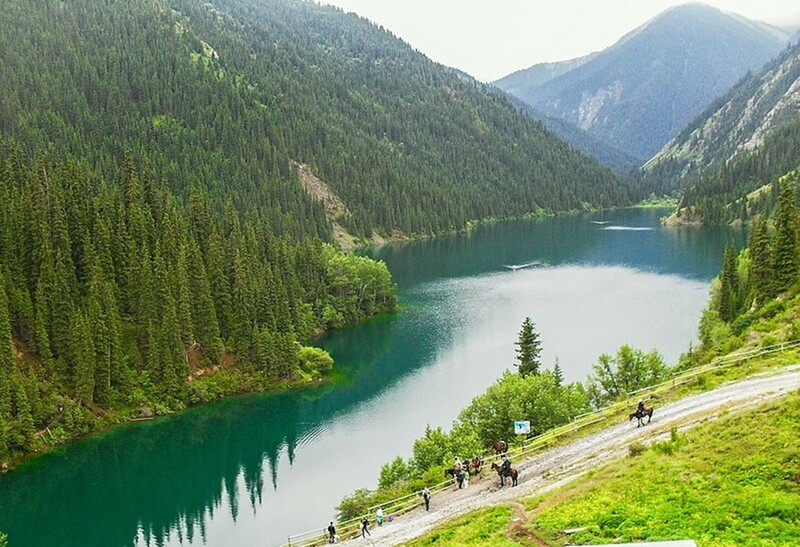 Three Kolsay Lakes are located one above another and are popular among tourists as good location for walks and horseback riding. Given that adequate road ends after the first lake and a steep mountain path leads to the third lake, a perfect tourist route has been paved between Kolsay Lake II and Kolsay Lake III. While walking along the route, you will be admiring untouched beauty of picturesque nature – fluffy fir trees pointing up their acute tops fully cover steep mountain slopes; clear lake water opalesce with all shades of blue and dark blue; flowery meadows and fringes call tired travellers to stop for rest and to treat themselves with berries and mushrooms. Advice: after long hours in the saddle be prepared to have your legs growing numb – that will make you to learn walking again by taking to your feet. Wearing right clothes is a must-have: of course, you don’t need to buy special jockey breeches with leather inputs, but gym wear will be useful as it covers your legs – this will prevent you from hurting your legs with the saddle foothold and from insects’ bites. If you enjoy galloping or if you are afraid of falling off the horse, then buy elbow and knee pads to protect your joints. You could use a helmet as well, but this is not so necessary, as usually horses intended for touristic tours are well-trained, calm and obedient. A wonderful tour across the forest-steppe area at the territory of elk farm. Here you will meet elks, deers, yaks in their natural habitat. Qualified instructor will teach you basics of the horse riding and will point out to you possible mistakes so as to ease your ride at maximum. 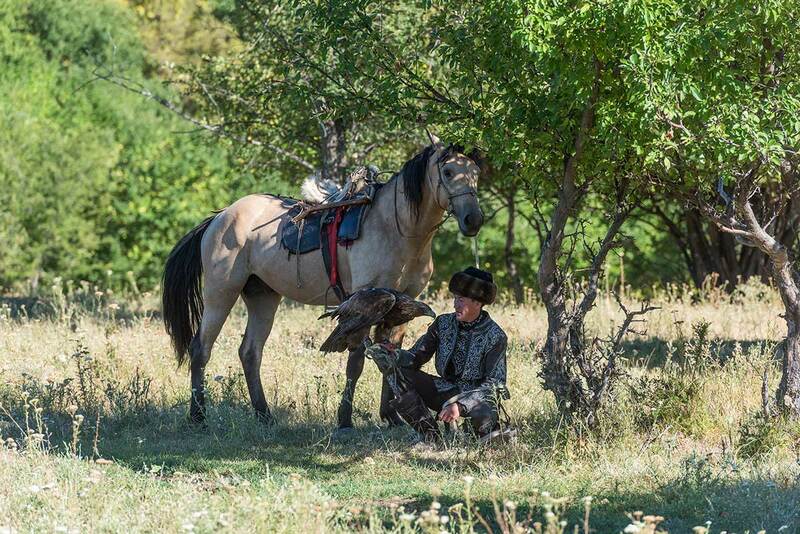 At the Borovoe’s exit, behind a poultry farm, there is a camping site that makes a specialty out of horse riding tours. The route itself is not lengthy; the whole way will take you around one hour, if riding slowly. Fast ride lovers will also like this location – this area is suitable for galloping. Also you can try horse riding within your hotel’s territory as many camping sites offer horse riding trips for moderate fee. 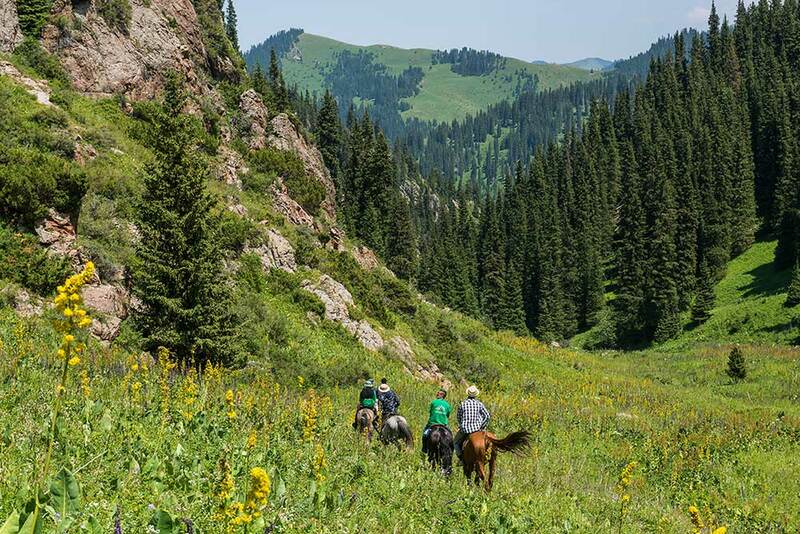 In case you are an experienced horse rider and you like long rides, then special for you, there is a tour from Astana to Borovoe with a stop in Akkol town. The town is located on the shore of lake with the same name. There you may have a rest and give some rest to your horses. Nature of Zailiskiy Alatau is rich with its various landscapes. The terrains are mainly mountainous, but among these there are forest-steppe areas as well as wide plateaus, high meadows and lakes. It is very convenient to enjoy all this beauty sitting on horseback, because some terrains are hard-to-pass or too lengthy for walking on foot (unless you are a trekking enthusiast). So choose any route (there is a great number of these! ), equip with our advice and go ahead, on an adventure! Below we introduce you several horse riding routes that are popular among local people and foreign tourists. 5-day horse riding tour to Kairakskiy waterfall through Oizhailyau area. It is a wonderful opportunity to dive into true nomad’s life: every day you will be passing, approximately, 20 km admiring views of Turgen’skiy Gorge, Assy Plateau (where you may gather lots of mushrooms and berries), Oizhailyau Natural Boundary and Donzhailyau Plateau, gradually, getting closer to the pearl of the trip – Kairakskiy Waterfall. For beginners and inexperienced riders it is possible to arrange lessons in the riding club and a one-hour ride to Butakovskiy Gorge in Zailiskiy Alatau Mountains. Qualified instructor will teach you basics of interaction with horses, so you will like such leisure activity. Several horseback tours of various distances at the weekends. The first tour of 12 km distance leads to Kim Asar Gorge including visit to Butakovskiy Waterfall. The second one of 14 km is to Alma Arasan Gorge including visit to mountain spur with a fabulous view on Big Almaty Lake and the city. The third tour of 16 km leads to Turgenskiy Gorge with climbing Kairakskiy Waterfall. Horseback riding to Krasnyi Yar Hollow along the picturesque river Oi-Karagai. This ride lasts for four hours and in the course of the trip you will be enjoying a rave of green colour and views that open up from the highest point of uphill climbing. 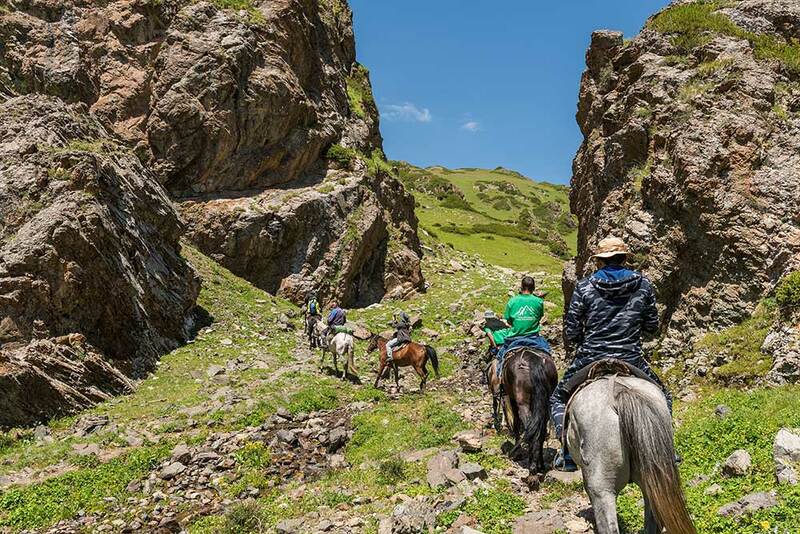 3-day horse riding tour towards mountainous country Kungei Alatau that starts from Charynskiy Canyon including way to Kolsay Lakes and climbing up to nameless mountain pass. By the way, some fabulous views of mountain peaks open up from that mountain pass. 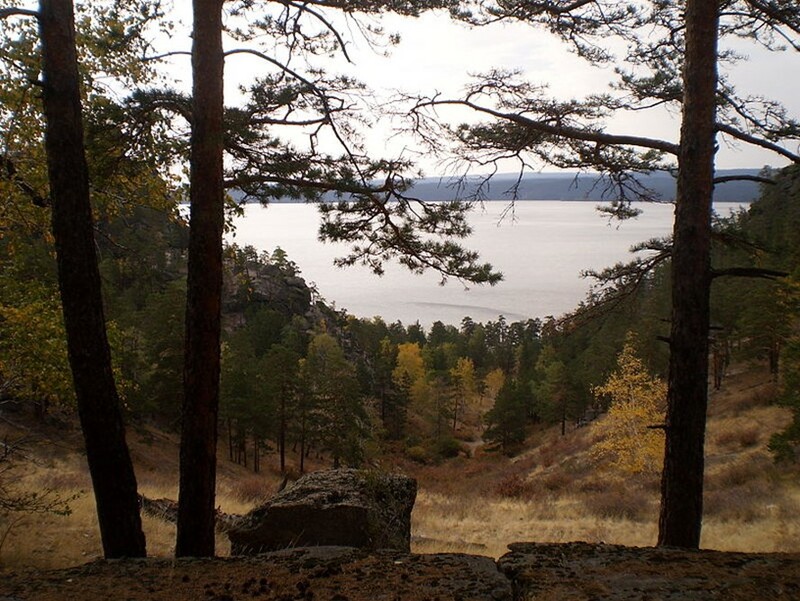 The last point is picnic on the shore of Kayindy Lake with its famous guards: acute trunks of Tyan-Shan fir trees stick out of pure clear water – the fir trees were growing there long time ago but then had been flooded with water. 4-day horse riding trip includes even more interesting locations: as always, it originates from Charyn Canyon, further on the travel leads to a cascade of three Kolsay Lakes, then – rather long pass to a mountain hut where you can stay for dinner and overnight; after that you will go along the river Taldy with access to Kaiyndy Lake, then – to the Moon Canyon. It is a very unusual place that reminds of the moon surface because of its landscape coloured into pale yellow colour. 5-day track is very similar to previous one but with an interesting peculiarity – a rather complicated way to Kolsay Lake (tourists have not visited it for so long) is added into the route. These are ancient mountain paths, where you can see not only traces of wild animals but also wild animals themselves in their natural habitat who are not afraid of people, as people rarely appear in those places. 6-day track includes some elements of walking trekking – climbing up to the middle Kolsay Lake along the wild mountain paths. Here you won’t meet any tourists but you will enjoy atmosphere of privacy and unity with the nature to the maximum. 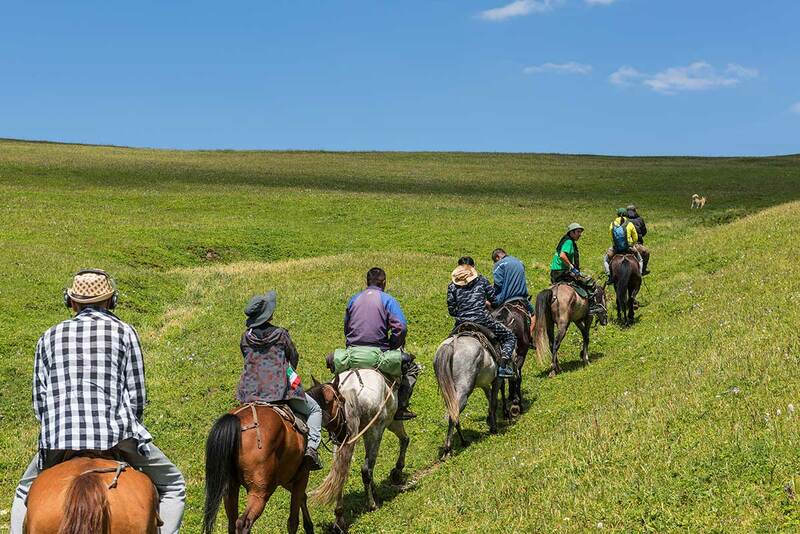 And finally, the most impressive and mystical, half horse riding and half walking trekking, route of 7 days – reaching Kolsay Lakes on horseback, passing by a mountain hut, and then climbing up Kyzymshek Mountain top with a fantastic view to Khan-Tengri Peak and Victory Peak. On the downhill you will see a lake Issyk-Kol and this is where the territory of Kyrgyzstan starts! Further on, a horseback journey is waiting for you till the Besmoinak Pass, rest, and then some walking to the middle Kolsay Lake with downhill towards Kurmety River and traditional picnic on the Kaiyndy Lake, finishing the route by the Moon Canyon. It is a busy programme, isn’t it? Dzungarian Alatau… It is a harsh but beautifully looking mountain range with total square of 700 sq.m., and with the highest peak at 4,5 thousand meters of height. Most local paths are animal trails and are completely unsuitable for walking and horse riding tourists. It is very dangerous to set off on such journey unprepared, that’s why it is better to travel with a group led by professional instructor. We offer you three routes with different length but equally rich for impressions. So take with you bare essentials only, everything else is already thought through for you! The first tour is of 6 days and is quite affordable in terms of horse riding skills, but a good physical shape and some experience in mountain travel would still be helpful. Long climbing uphill and downhill, some dangerous short distances may upset you a bit but you will be rewarded with the views opening up in front of you and with gained impressions. And, in the end, we all like some extreme, don’t we? 8-day route is not for quiet holiday lovers. There are wild nature, forgotten mountain paths with increased level of complexity and inexpressible sense of freedom from civilization. You may meet some wild animals there; most importantly, that is not a bear you met, as bears also inhabit that area. A pearl of the whole travel is a wonderful mountain lake hidden from pervasive tourists. 9-day journey is not for everyone. It is desirable to be in very good shape and some experience in staying high up in the mountains. There are extremely difficult paths into depth of Dzungarian Alatau, rocky cliffs, overnight in a tent camp and many-many more! As you see, there is a variety of excellently arranged horseback tours to choose from: there is a suitable tour for everyone, both for a beginner and for an experienced rider. We just will add some recommendations: soberly assess your opportunities and choose the route you really like. Do not start a 9-day journey if you are not confident in your physical shape; there are many easy and equally impressive tours. Believe us, the best and brightest impressions you will gain from a comfortable horse riding journey. Otherwise, you will be constantly distracted by your fatigue from the main thing – watching the grandeur of nature and experiencing little camping joys that form a basis of all warm memories about time out there.